Hint Health is a startup building the technology necessary to support emerging healthcare businesses. Their beachhead customers are direct primary care providers who offer primary care services directly to the patient without the complexity and overhead of the insurer relationship. When I was brought onto the team, Hint engineers had successfully launched an MVP feature set. Overall, the product was well-received by customers and growing, but the product needed more flexibility and scalability. The design team was comprised of my supervisor Laura Klein, VP of Product, co-designer Marie Mariano and myself. We designed openly with the engineering team and communicated our designs via extensive wireframe and detailed design stories. Within two days of my on-boarding the design team was performing interviews with current and potential Hint Health clients. The interviewees ranged from solo practitioners to multi-location practices and included physician, business operation partners and HR representatives. 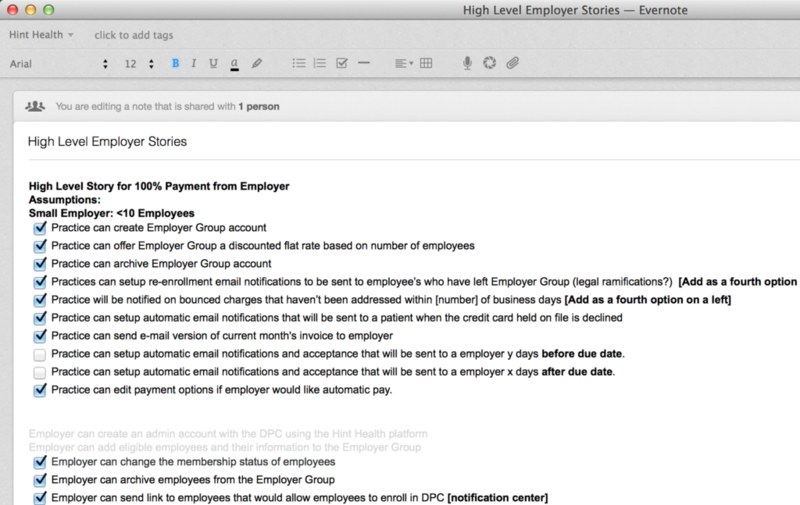 After the user interviews, we developed design stories to begin addressing the feature set. The inherent complexity in shifting the onboarding process from one provider and one patient, to one provider many patients required a deeper look into the relationships between the different users (employer, employee, patient, DPC Provider/Practices and more). The detailed design stories describe– from a high level epic down to the edge cases– all the ways in which a user can interact with the platform. Thinking through all potential eventualities in advanced, resulted in a more robust product build. The design stories were also the point at which we scoped what features to include (think: flexible pricing) and which to postpone (think: notification centers). 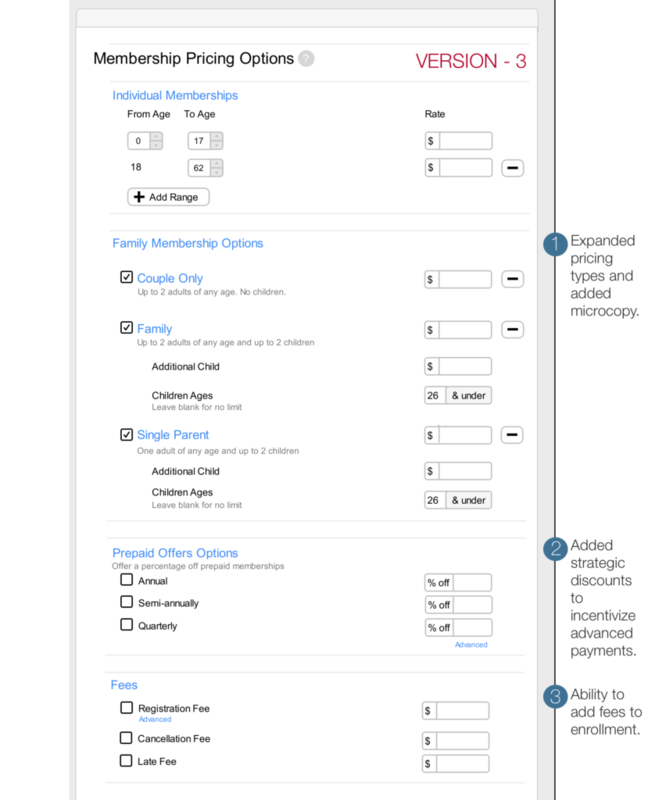 Using user state charts we explored the implications of changing a user’s status. Can all state changes be made? Which ones cannot? 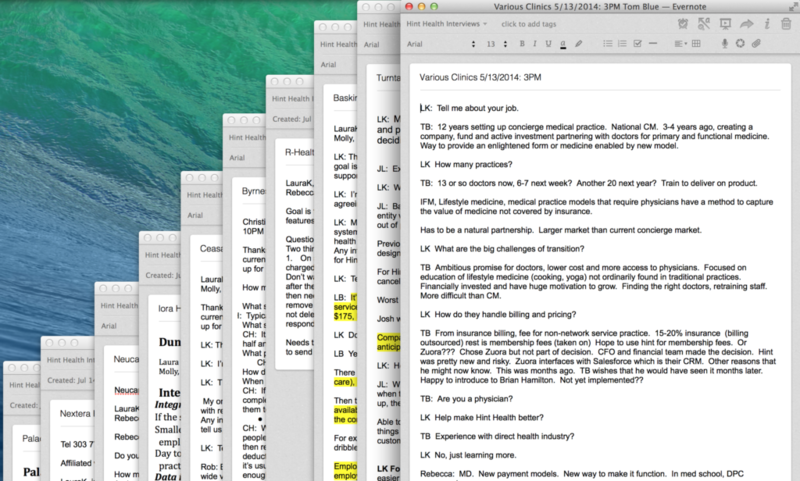 How do we communicate that preliminary tasks need to be completed before status change become optional? What messaging must be included? The page schematic below helped differentiate and simplify the interfaces. 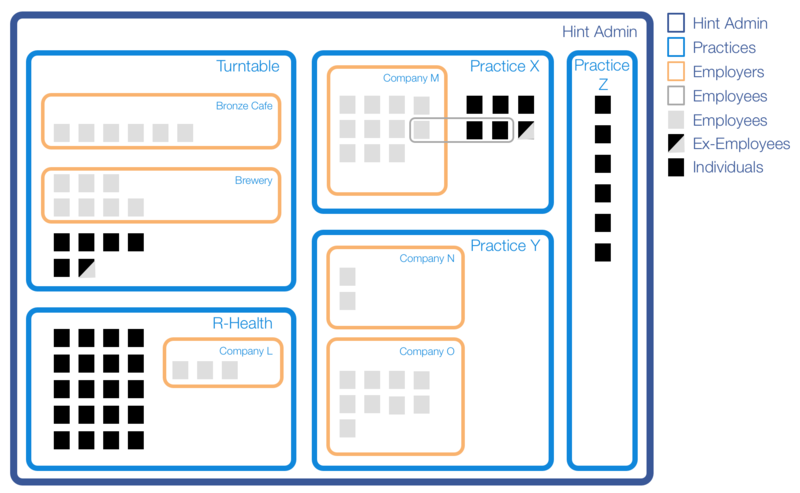 In dark blue is the Hint Health platform encompassing all DPC Providers (light blue boxes), in orange are the companies for which the practice hope to onboard, and within the orange squares are the employees(gray squares). 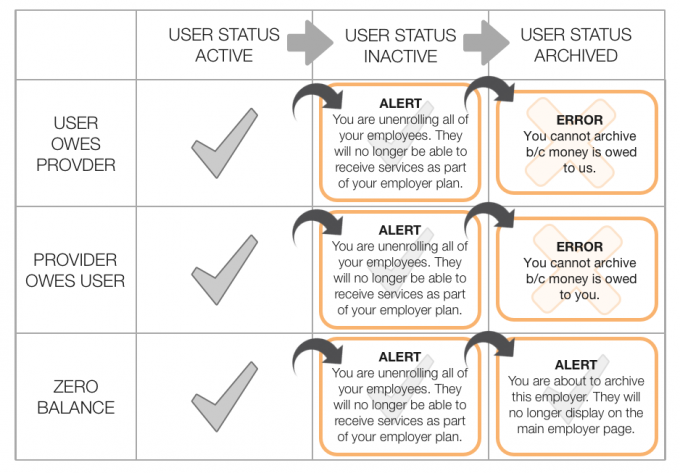 The page schematic demonstrates additional, edge relationships: employee vs individual patient, and ex-employees converting to a membership status of individual after leaving the employer’s plan. Due to the complex navigation and process heavy design, we mapped user flows describing how a user moves through the process. High level interactions included potential interactions on web, email and phone. 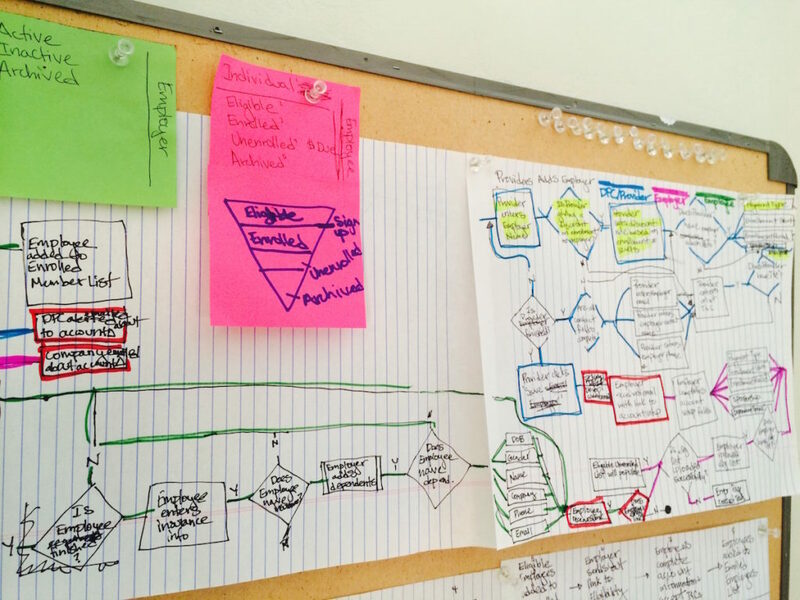 As the task flow begin to gain more clarity, we needed to begin sketching out the user interface. 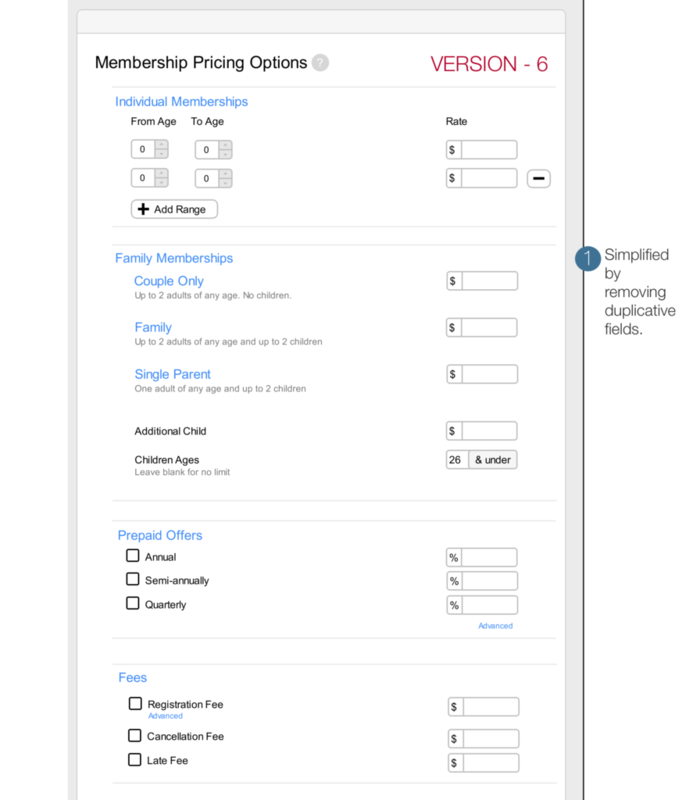 Below are sample screens a doctor would experience when they were setting up their firms membership pricing. In some cases practices structured their business by age, for others by family size. Due to business requirements offering savings based on payment plans were also necessary. And finally, certain firms needed the ability to apply fees to discourage drops in health coverage or late payments. Visit Turntable Health for a sample of the shipped product.